If you own a large smartphone — often called a phablet — you know how hard it can be on your hands to use the touchscreen. You’re constantly stretching your thumb to reach icons and functions located at the top of that device. The Samsung One UI aims to help with that, using ergonomics features designed to reduce repetitive stress in your hands. 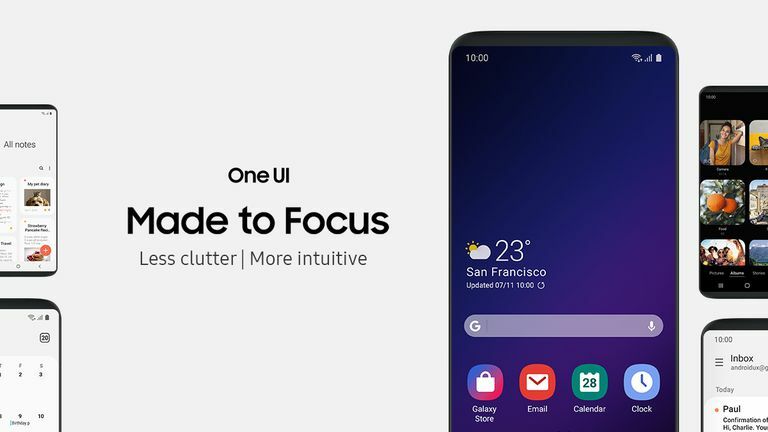 To understand how Samsung One UI will be easier on your hands, you first need to understand how current smartphones could be causing damage. The first problem is the size of the phone. Larger smartphones mean larger displays, which puts the information you need to use further away from your fingers and thumb. Ever tried to tap an app in the far right corner of your screen when you’re using your device one-handed? Not only is it difficult to do, but it means stretching your thumb as far as your muscles will let you stretch. The problem with over-stretching those muscles is you can injure them. And injuring them repeatedly causes Repetitive Stress Syndrome. Another problem smartphone users could encounter is the constant typing and tapping on their device. Typically, people tend to use only their thumbs when typing or accessing applications, and because these motions are repetitive they also cause stress, sometimes referred to as De Quervain Syndrome, or an inflammation of the tendons that control the movements of the thumb. Since many people use their phones for 3.5 hours or more every day, the problem is only getting worse. According to Samsung, when the company designed the One UI user interface, it did so with usability in mind. In other words, one design aspect of the user interface — also called a skin — was to make a larger phone easier to use with one hand. For example, one of the changes made in One UI is to creation of virtual division between what Samsung refers to as a viewing area and an interaction area. The Interaction Area: The interaction area, which will be on the bottom half of the screen, is where users will perform most of the tapping and swiping needed to access and use menus and functions on the device. This division of functionality means the buttons you use most often are located at the bottom of the device, within reach of your thumb when using the device one-handed. In One UI, Samsung also groups the most frequently used functions together, so everything is in one place.